Hogmanay is the Scottish New Years Eve celebration which can last for days and days; it is well known that no-one celebrates the eve quite like the Scots. What fun! It is believed that the Scots inherited the celebration of Hogmanay from the Vikings who traditionally would celebrate the shortest day of the year. As Christmas was all but banned and only very quietly celebrated in Scotland from the end of the 17th century until the mid-1950’s, New Year's Eve became something of a good excuse for revelry as well as the, hardly needed, excuse to drink whisky and eat good food which had not been allowed over the Christmas period under the ban. Now, the Scots get to do both Christmas and Hogmanay but in no way has that lessened the fun, games and antics carried out on December 31st, many say they may even have grown since the ban was lifted. As midnight strikes it is the strains of Auld Lang Syne, Robert Burn's version of this traditional Scottish air, which can be heard everywhere including across the borders in England and many other countries around the world. This singing is then followed by a toast to health, wealth and happiness for the coming year then finally, the custom of First Footing. Fireworks have, like the rest of the world become synonymous with New Year's Eve in Scotland as well. Edinburgh in particular hosts an amazing display around the castle. First-Footing is the visiting of friends and family immediately after midnight and sees the Scots rushing from house to house to welcome in the New Year. To bring the best of luck for the following year, the "First-Foot" in the house traditionally is a dark, handsome male carrying a piece of coal, whisky, Scottish shortbread and black bun - a rich dark fruitcake encased in pastry. The visitor in return receives a small glass of whisky. That it must be a dark, handsome man is believed to hark back to the Vikings who were blond and arriving on your doorstep at any time was not the best thing to happen to you. Hence, a dark-haired male gives a greater sense of security. Many of the Scottish customs have infiltrated into the rest of Britain. Though First Footing is less common south of the Scottish border, the singing and toasting - sometimes followed by fireworks - can be heard throughout the British Isles. And, of course, the drinking and eating is obligatory though Haggis will rarely be served. 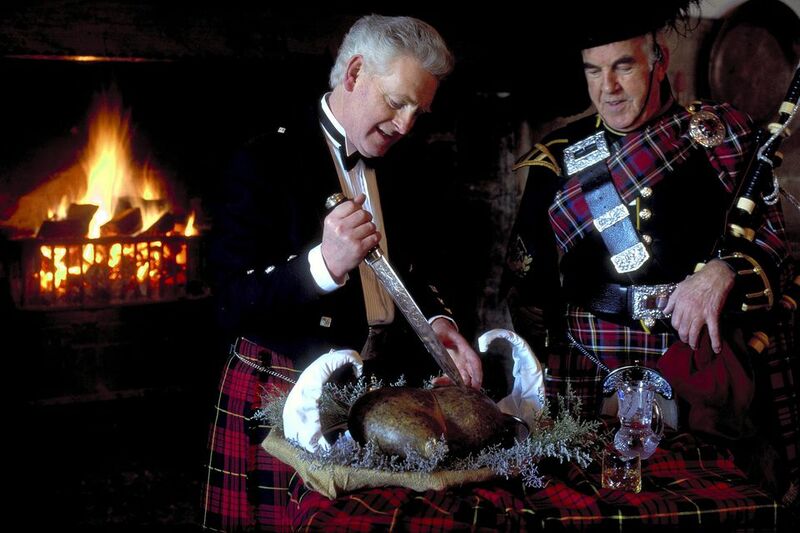 The foods of Hogmanay are as traditional as any first-footing or singing. Within this list, there are all the foods you can expect somewhere in Scotland at the celebrations. And as mentioned before, don't forget the whisky.